We have good news! 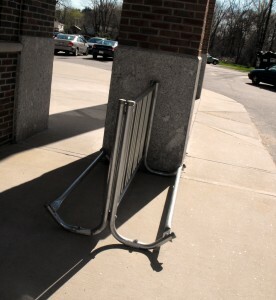 Last year Methuen Rail Trail requested CVS on Broadway install a bike rack. Last month, when they did the repairs from the flooding, they installed a bike rack, however they installed it sideways. There is not enough room on either side for a bike to park, not people to pass. I have already requested that they turn it.